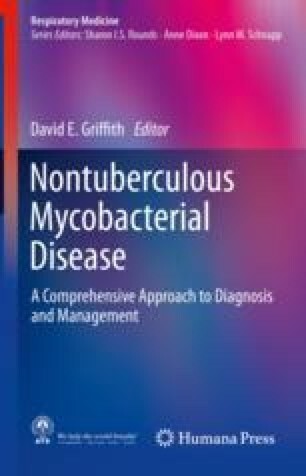 The following chapter focuses on the epidemiology, prevention, diagnosis, and treatment of nontuberculous mycobacterial disease in different immunosuppressed and immunocompromised patient populations. Underlying causes of immunosuppression that increase the risk of nontuberculous mycobacterial disease include acquired immunodeficiency syndrome and certain types of primary immunodeficiency, cancer and its treatment, and solid organ and hematologic transplantation. More recently, evidence has suggested an increased risk with the use of immunosuppressive medications such as oral and inhaled corticosteroids, and biologic therapies used to treat autoimmune inflammatory diseases. In many immunocompromised patients, nontuberculous mycobacterial infections more commonly present as extrapulmonary disease (i.e., skin, soft tissue, or disseminated infections), although in some settings of immunosuppression (e.g., sarcoid, lung transplant), pulmonary presentations are common. Mycobacterium avium complex and rapid-growing mycobacteria (e.g., Mycobacterium abscessus and Mycobacterium fortuitum) cause the most disease, with several uncommon species (e.g., Mycobacterium haemophilum and Mycobacterium genavense) causing disease exclusively in immunocompromised patients. Treatment of those with nontuberculous mycobacterial infections and underlying immunosuppression frequently involves parenteral-based multidrug antimicrobial therapy and efforts to reduce immunosuppression. Treatment should be undertaken by experts per current American Thoracic Society/Infectious Disease Society of America treatment guidelines. Position Statement 17-ID-07: Standardized Case Definition for Extrapulmonary Nontuberculous Mycobacteria Infections. Council of State and Territorial Epidemiologists. Available at http://c.ymcdn.com/sites/www.cste.org/resource/resmgr/2017PS/2017PSFinal/17-ID-07.pdf, Last accessed 17 Nov 2017. U.S. Department of Health & Human Services Organ Procurement and Transplantation Network. Transplant: Organ by Transplant Year (2015–2061). Found at https://optn.transplant.hrsa.gov/data/view-data-reports/build-advanced/. Last accessed 11/6/2017. Pasquini MC, Wang Z. Current use and outcome of hematopoietic stem cell transplantation: CIBMTR Summary Slides. (2013). Available at: http://www.cibmtr.org.